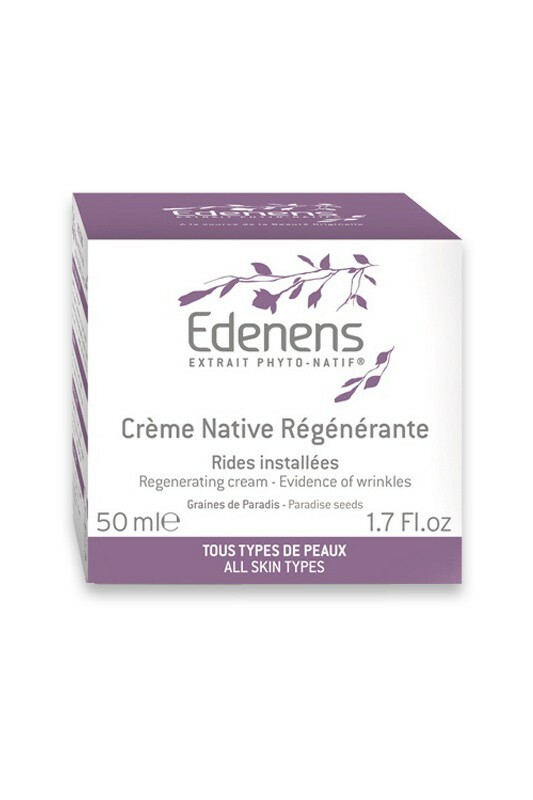 Edenens Regenerating Anti Wrinkle Cream is an anti ageing skincare for all skin types which contains a precious combination of natural actives that reboost skin rejuvenation. Paradise Seeds protect it from skin ageing thanks to its high content of tannins and vitamin E. Native Collagen forms a protective veil while Hyaluronic Acid moisturizes*, plumps and tones skin. Phyto-Native Extract feeds skin cells with essential nutriments : peptids, amino acids, minerals. 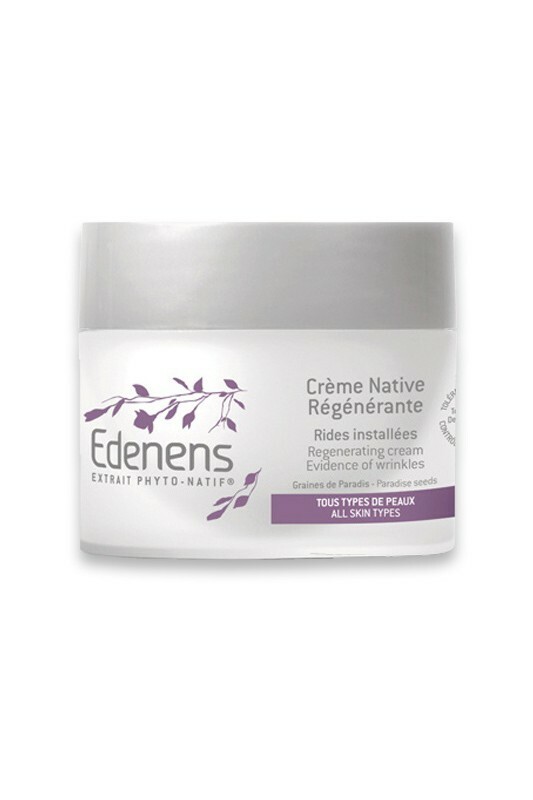 After one month of using Edenens Regenerating Anti Wrinkle Cream, your face seems lifted, wrinkle appearance diminishes significantly. Your skin regains firmness, elasticity and youthful substance. Skin tolerance tested under dermatologist control. Non comedogenic. Je commence son utilisation et la texture légère et fondante est très agréable à appliquer avec une excellente pénétration, sans film gras. Le fini est velouté et permet l'application du fond de teint minéral. Pour les résultats, il faudra que j'attende un peu ! 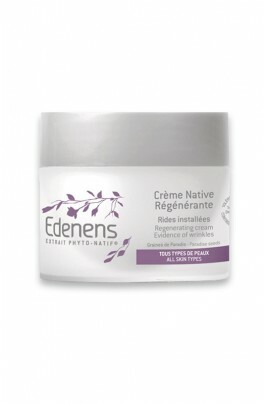 Apply day and night Edenens Regenerating Anti Wrinkle Cream on perfectly cleaned face and neck. Aqua, Glycerin, Tribehenin PEG-20 Esters, Octyldodecyl Myristate, Isostearyl Isostearate, Glyceryl Stearate, Caprylic/Capric Triglyceride, Alcohol, Cetyl Alcohol, Soluble Collagen, Hydrolyzed Soy Protein, Fagus Sylvatica Bud Extract, Onopordum Acanthium Flower/Leaf/Stem Extract, Hydrolyzed Hyaluronic Acid, Aframomum Melegueta Seed Extract, Palmitoyl Oligopeptide, Palmitoyl Tetrapeptide-7, Helianthus Annuus Seed Oil, Tocopherol, Parfum, Carbomer, Xanthan Gum, Butylene Glycol, Polysorbate 20, Sodium Hydroxide, Sodium Lactate, Benzyl Salicylate, Linalool, Butylphenyl Methylpropional, Limonene, Citronellol, Geraniol, Hydroxycitronellal, Benzyl Alcohol, Sodium Dehydroacetate, Dehydroacetic Acid, Phenoxyethanol, Benzoic Acid, Sorbic Acid.